My lovebird recently started laying eggs again. She is a chronic egg layer, which has always concerned me. She had already laid three eggs and the fourth was supposed to be laid by Friday morning. It is now Saturday evening and there is no egg. The feathers around her vent are fluffed such that I can see the vent itself. The vent isn't dirty, however. She is vocalizing, eating, and moving around a lot, but her droppings are not normal. 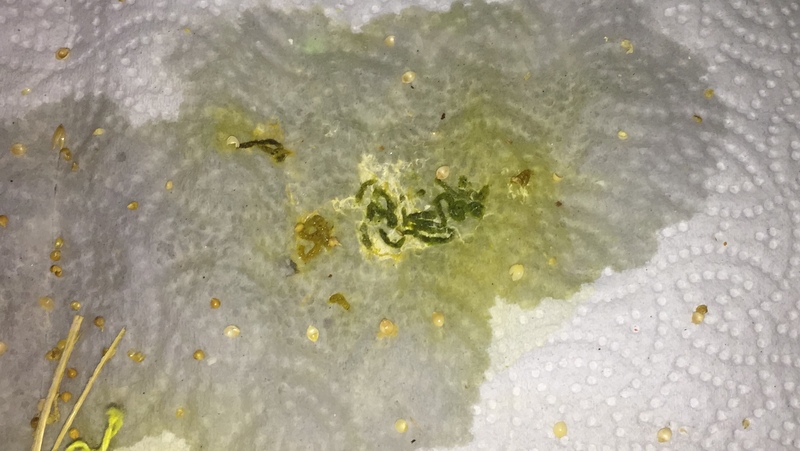 I came home to find yellow strands of feces, yellow fluid on her food plates, and large wet spots on the paper towels at the bottom of her cage. 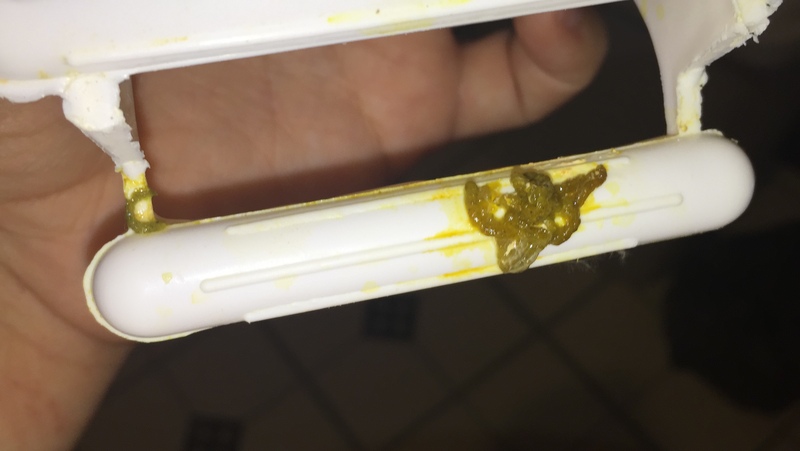 I also saw her strain and pass what looked like egg white. That's the best way I can describe it. It also seems like the top of her tail almost trembles and she does have labored breathing to some extent. Does this likely mean that the egg broke inside her and she's expelling the fluids? What about the shell? Will this be hard to treat? There are no experienced avian vets open near me on Sundays. The earliest I could get to a certified avian vet would be Monday. I could go to my regular vet tomorrow because he will be open but I am not sure I trust him to know what to do, as birds aren't his specialty. He did remove an egg for me once, though. Is it safe to wait until Monday? Should I see my regular vet tomorrow? What can I ask him to do? And very importantly, what should I NOT allow him to do? I want to go in informed so he doesn't hurt her more. Thank you. That is all I have noticed until now. She continues to vocalize and move around as if nothing were wrong. Here are some pictures of droppings. I&#39;m sorry that your question wasn&#39;t answered in a timely manner. I would be concerned that your lovebird expelled a shell-less egg rather than having one break inside her (which is also possible). Her excessive egg-laying may well have left her calcium deficient which would explain the lack of a shell or a very weak one which broke. I would heat her environment up to 85F and make sure her diet was supplemented with calcium - the tops of fresh greens, dairy products, e.g. - and schedule her with her avian vet who may recommend X-raying to better understand what&#39;s going on in your birds oviduct and cloaca. I&#39;m concerned about &quot;labored breathing to some extent&quot;. This can be due to a dietary deficiency but also respiratory compromise from infection or any number of metabolic disorders. Presumptive antibiotic therapy may be prescribed after she&#39;s thoroughly examined.For now, add a water soluble avian vitamin such as Oasis brand to her water at half of the recommended dose so as not to make her water distasteful. Add a calcium supplement such as Calcivet or Calciboost to her water. These supplements are available in pet/feed stores. Avoid over the counter antibiotics designed to be placed in her water. They won&#39;t be effective if only because an ill bird won&#39;t drink enough to medicate itself properly.Nutritional imbalances are a common cause of illness in our pet birds - particularly prolific egg layers. What has her diet consisted of, please? Seeds should compose less than 20% of her diet. Ideally, a balanced pelleted diet such as can be found here: www.harrisonsbirdfoods.com or here: www.lafeber.com/pet-birds should be fed as well as hard boiled egg yolk, pancakes and cornbread, the tops of fresh greens, dairy products such as yogurt and cheese, fresh fruits such as apples, pears, melon, kiwi, and berries, vegetables such as broccoli, carrots, beets, asparagus, cabbage, sweet potato, and squash, and even tiny pieces of meat.Please respond with further questions or concerns if you wish. I have 5 egg laying hens. I am relatively un-experienced.